Knickernappies Sighting: Video Review & Giveaway at DirtyDiaperLaundry.com! We're super excited about today's Knickernappies Sighting! 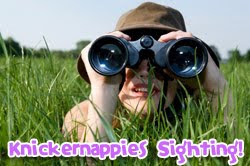 Kim over at Dirty Diaper Laundry has featured the Knickernappies Onesize Diaper in one of her famous Video Reviews! She received the diaper courtesy of No Pins Required. What else is great? No Pins Required has also sponsored a Knickernappies Giveaway at Dirty Diaper Laundry! There are many easy ways to enter this Giveaway and you may enter until May 17, 2010. So run on over to Dirty Diaper Laundry, read the rest of Kim's comprehensive review and comment to let her know what a great job we think she did! While you're there don't forget to enter the GiveAway! Good Luck!